Well, summer vacation 2017 is upon us and that means that there’s two more months until school starts again, ushering in Lady Buggy’s inaugural season! Sarah and I are busy little beavers (there must be an invertebrate version of that saying…) preparing program details, selecting and collecting friendly little creatures, and polishing off the website. 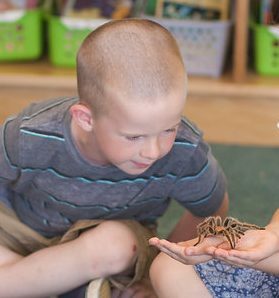 In fact, I just replaced the generic images with some original photos of a certain adorable six year old (who may or may not be my own daughter) and her friend checking out our Chilean Rose named Aragog. Thanks to Jamie Swainson of Lola Mac Photography for the gorgeous shots, and Mrs. Hamilton of McKenzie Towne School for the use of her classroom. Stay tuned for more developments in the continuing story of the building of Lady Buggy– small creatures, big learning.